Indonesian authorities continue to evacuate villagers following a catastrophic volcanic eruption. On Saturday, the heavily volcanic archipelago of Indonesia saw an eruption on the island of Palue in the nation’s eastern province of East Nusa Tenggara. After rumbling since last October, Mount Rokatenda finally erupted early on Saturday morning, forcing the evacuation of 3,000 people and killing six locals who were still sleeping in their village of Rokirole by Ponge beach. According to Wired, the victims were three adults and three children, who were buried under a pyroclastic flow, described as a “fluidized mixture of solid to semi-solid fragments and hot, expanding gases…that move much like a snow avalanche.” The adults’ bodies were recovered, but the children’s have not been found. According to Frans Wangge, who was staffing the volcano’s monitoring post, lava singed trees and ash blocked access to the victims. Prior to the eruption, some 2,000 villagers had already been moved to safer locations, but 8,000 still remained on the island. Local authorities mounted a search and rescue operation for the remaining residents, which was still ongoing yesterday as the mountain continued to spew rocks and ash 600 meters into the air. “The activity remains high and at dangerous levels. There are no signs it will stop erupting any time soon,” an official said. 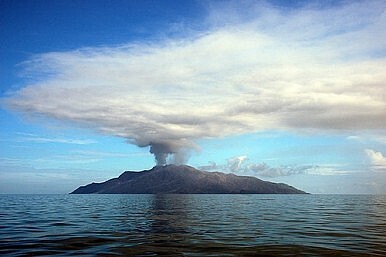 Indonesia is home to some 129 active volcanoes, and is also a hot spot for earthquakes. Two eruptions on Thursday hurled ash and rock at densely populated villages in Java.